← I Am The Power! It’s certainly one of the things that has always attracted me to Dungeons & Dragons. I love dungeon maps. From the classic old blue grid maps like the Caves of Chaos, to the isometric maps of Ravenloft and Dragons of Dispair (for all the flaws with that module the map is solid gold), or the beautifully styled maps we see in Goodman Game’s modules for Dungeon Crawl Classics. I love world maps. Darlene’s Greyhawk is still the gold standard, but the map of the Forgotten Realms from the grey box is also magnificent. Our local museum used to have a map of Middle Earth on the back of the door to their office. It was a straight forward line drawing, but not the one from the books and I’ve never seen that specific design again. I spent as much time looking at that map as some of the exhibits. Years ago an individual used to make hand drawn maps of the Known World of the Society for Creative Anachronism. I have one on my wall, from way back in A.S. 22 (1988 for non SCAdians). It’s a marvelous piece of art on par with anything TSR put out. Duke Syr Merowald of the Midrealm is the artist. I adore the cloth maps that came with the Ultima computer games. The map of Britannia from Ultima V is my favorite. Maps represent possibilities. They let our imaginations explore as we dream of where we can go and what we can find. For me, role playing games are about exploration and maps represent that. Every now and then I pull out my sketch book and make my own attempts at designing maps. Over the years I’ve found I have certain preferences. These are not “right or wrong” rules of map making, they’re just the things I like. For instance, with dungeon maps I prefer black-and-white (or blue-and-white) to full color and I don’t care for textures, especially on the dungeon floors. I find that these tend to distract the eye from the layout. However, I do like simple graphics and icons in the map, such as summoning circles or wells drawn in the rooms. I like the occasional 3d element, like an archway or dolmen drawn as the gateway to a standard 2d hallway. I love artwork around the sides of the map, which can be simple filler art or the extravagant and intricate images worked into the Dungeon Crawl Classics maps. While aesthetically I appreciate dungeon maps done without a grid, such as the wonderful maps Dyson Logos produces, for practical use I still prefer to have a grid. It’s the old school Dungeon Master in me, who wants to figure the blast radius of a fireball quickly. But I must admit, the work Dyson creates is winning me over. If you’re not familiar with his blog, Dyson’s Dodecahedron, you really need to change that. For world maps I like both color and black-and-white, but I still prefer simple styles. I don’t want my eyes spending too much time figuring out what something is, I want them to roam over the map with ease. This map from FreeFantasyMaps.org has captured my imagination with its style and my sketchbook is currently filling up with ideas based on it. The map was created using Campaign Cartographer, which is the name in map making software. It’s not cheap, but it’s amazing what you can produce with it. For those of us on a budget, I recommend Hexographer. The free online version suits my regular needs and the pro version is not expensive. I’ve also experimented with drawing on my iPad, described here and here, and for that I still recommend Sketchbook Pro. It’s a bit limited, but you can still whip out some decent maps in short order. Plus the cost of the app and a simple stylus will only put you out around $10, so it’s definitely worth giving a try. Still, for the most part I like the Luddite method of pencils, pens, and paper. One of these days I’ll even learn to use my scanner correctly and then I’ll post some of my own maps. What do you like in a good map? What maps in particular have captured your imagination? 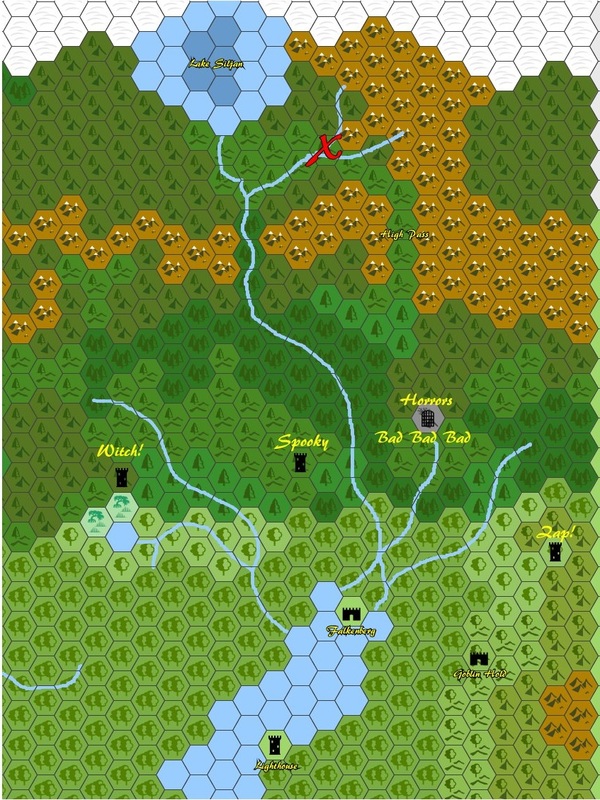 How do you make your own maps? I made this map using Hexographer’s free online tool. I like the overall design, but if I were going to remake it I would drastically reduce the variety of icons I used. How many different forest icons do I really need? Still, it’s a good example of what the tool has to offer. I had this lazy but, as it turns out, useful habit of making dungeon maps that tended to have one central hallway with lots of distributary hallways and room sets, usually with an obstacle, secret door or nigh-impassable gate at the end of the main hallway that required some interaction with the branches to get past. Very Infocom. As for the griddiness of dungeons, I always assumed that square-edged 10×10 hallways got made that way due to some really common tunneling magic or technique that dwarves or goblins developed. I had and loved the Sosaria and Britannia cloth maps too. Do you have the original maps? While I tolerate a lot from dungeon maps, I prefer world maps that have a sense of natural forces at work. For example, Middle-Earth’s map has always grated on me because Mordor, with its square mountain range border, always makes me think “the DM drew this”. Really useful post, with great links. I’ve used the central hall design before too, though not the impassable gate. I like that. I still have several of the cloth maps! Including Ultima V, my favorite. I even have my Ultima V coin, though unfortunately I never had an ankh from IV. I keep my eye out for one. I get you’re take on Mordor, but in a sense you are correct. Didn’t Sauron raise those mountains himself? I know Morgoth raised the mountains around Angband and Utumno. I’m like you, I like to have at least an explanation on why something is there, even if it’s thin. I may have a post about that coming up actually. Your comment about room dimensions reminds me of a story. My dad was in the army and a friend of his got in trouble during basic training. As punishment the drill instructor ordered him to dig a foxhole six feet wide and six feet deep. My dad’s friend finished the job in record time, the corners of the hole were perfectly squared, and the bottom was level. My dad’s friend was the son of the cemetery’s sextant and grew up digging graves. He thought this was a hell of a deal, as now he was getting paid for the digging. Thanks for stopping by and thanks for the comments! I’m glad you like the links.